About Air Filtration Management, Inc.
We at Air Filtration Management, Inc. thank you for this opportunity to introduce you to our organization, and the services we offer. Air Filtration Management is a worldwide independent, NEBB (National Environmental Balancing Bureau) certified firm specializing in the testing, balancing, and certification of cleanrooms, HEPA filters and clean air equipment. We offer you the benefits of a full service company while our independence assures you of a non-biased evaluation of operation performance levels. Thoroughly trained technicians perform cleanroom certification using NEBB Standards, ISO International Standards, IEST Recommended Practices, and our own AFM Procedural Standards. Our professional experience and expertise provide the foundation from which we build to offer immediate solutions to problems that arise during the evaluation process, affording your project a smooth and efficient completion. 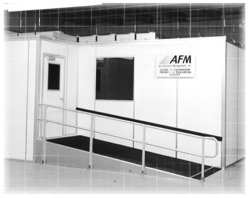 Attention to detail has led AFM to develop a certification program which offers individualized performance evaluations tailored to your unique requirements including such specific services as precision filter integrity testing utilizing robotic scanning equipment and a filter challenge using Polystyrene Latex Spheres (PSL). No matter the degree of sophistication your project demands, our certification program is always backed by explicit test report documentation. Our innovative style of presenting the test data through Computer Aided Drafting (CAD) results in a clear and concise report produced in a timely manner. Our commitment to customer satisfaction has enabled us to develop a list of customers with cleanrooms of diverse size, configuration, and cleanliness classification in all types of industries. We look forward to the opportunity to be of service to you and adding you to our list of satisfied customers.